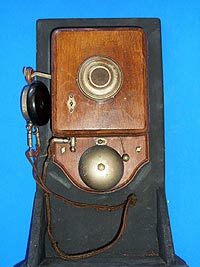 Early telephones had wooden cases and only contained a microphone and earpiece and the circuitry necessary for transmitting and receiving the human voice. In most cases the microphone was fixed to a wall mounted unit because it was sensitive to movement and the earpiece was on a length of cable. Other essential items required to make the telephone useable such as the bell were provided in a separate unit called the Bellset.Also with the earliest telephones, the only way to call another person was to ask an operator to make the connection for you. 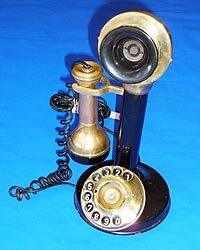 It was only after the invention of automatic telephone switching by Almon B Strowger and the opening of the first automated exchange in the UK in 1912 that the telephone dial started to appear. 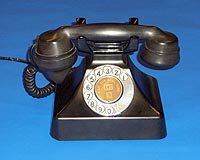 The invention of Bakelite — a brand name for a product that was developed in 1907–1909 by Dr. Leo Baekeland — led to the creation of two iconic British telephone designs — the 200 and 300 series. Formed by the reaction under heat and pressure of phenol and formaldehyde, Bakelite was the first plastic made from synthetic components which was exploited for its electrically nonconductive and heat-resistant properties. It soon became extensively used in the manufacture of telephone handsets. This telephone is manufactured by Astral and is a modern reproduction of the classic candlestick design. 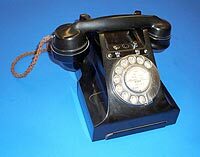 Whilst the search is on-going for an original example this modern telephone is included to represent the type. Early telephones did not contain an integral ringing bell. Therefore external bellsets like this one had to be installed to alert customers to an incoming call. Designed in partnership between the GPO and Siemens Brothers in the mid to late 1920s. This particular telephone was used within the internal telephone system of soap powder manufacturer Albright & Wilson in Whitehaven. Developed in partnership between the GPO and Ericsson Telephones Ltd (UK) in the mid 1930s. Today this type is perhaps best recognised as the Banker's telephone in Noel Edmonds' "Deal No Deal?" television quiz show.